Two more Irish Catholic bishops have resigned in response to a report which criticised how they handled allegations of abuse by clergy. Eamonn Walsh and Raymond Field issued a joint statement which was read out at midnight Mass on Christmas Day. Four out of five bishops named in the Murphy report have now resigned. 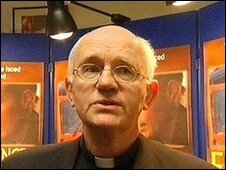 Martin Drennan, the Bishop of Galway, is now the only one of five bishops named in the Murphy report to remain in office. After the report was published Bishop Drennan said he was comfortable with the findings as it "says nothing negative about me".